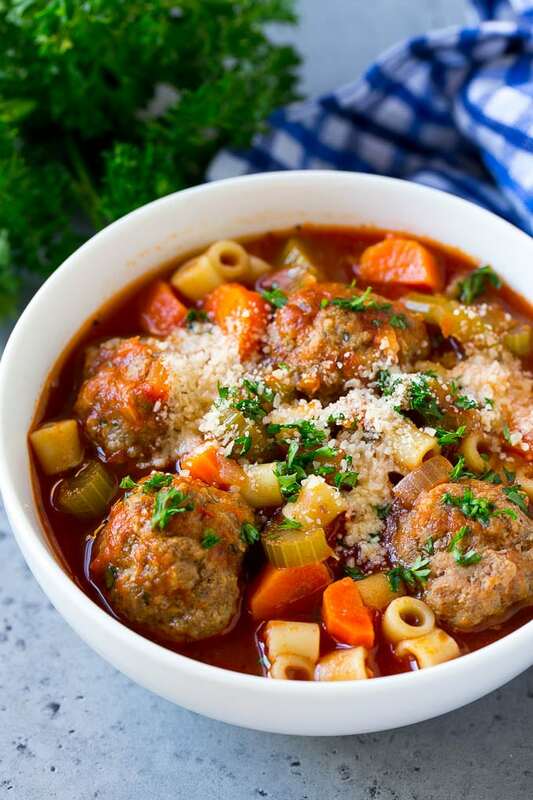 This Italian meatball soup is tender beef meatballs, vegetables and pasta, all simmered in a rich tomato broth. An easy dinner option that’s perfect for a busy weeknight! My family happens to love meatballs, especially the kids. I make sure to put meatballs on our dinner menu on a regular basis. 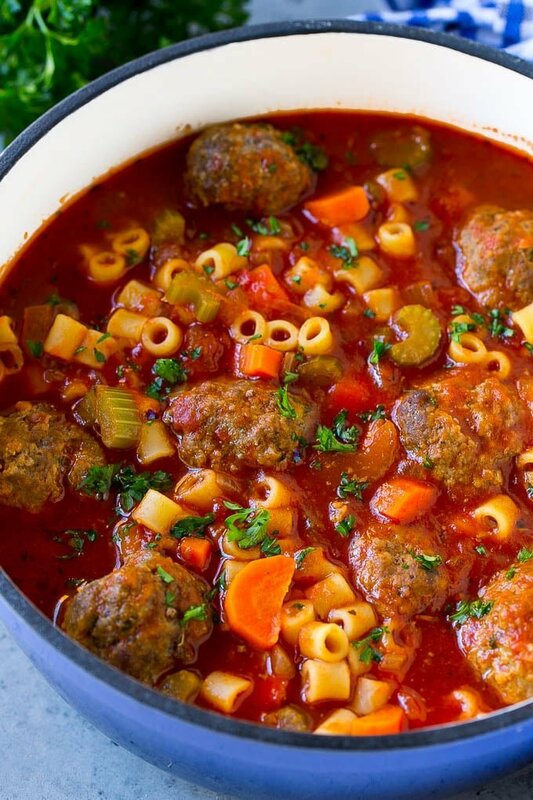 I often do cheesy meatballs or Greek meatballs with rice, but sometimes I like to mix things up a bit and serve this hearty meatball soup. Soup is always a great option when it’s cold outside, and I find myself making this meatball soup constantly during the winter months. It has similar flavors to the classic spaghetti and meatballs, but in soup form. Best of all, my kids adore it and happily eat the veggies in this soup! 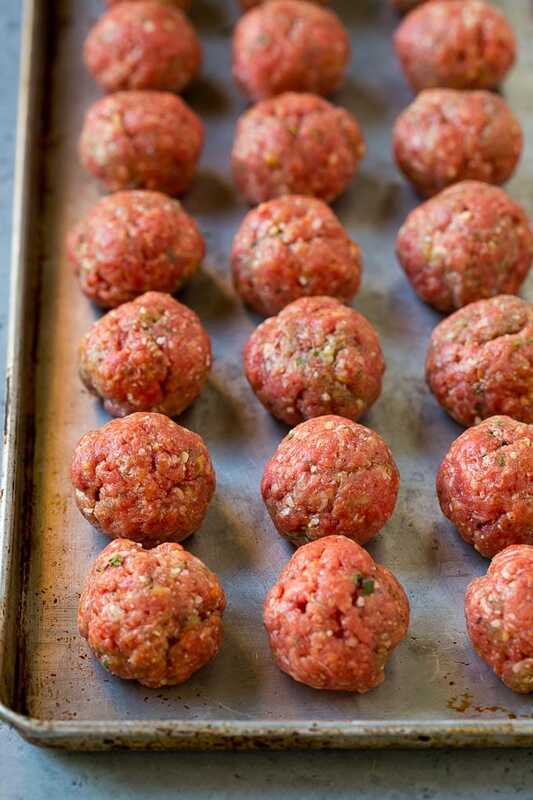 The first step is to make your meatballs. We’re going Italian style here, and these meatballs contain seasoned breacrumbs, herbs and spices, parmesan cheese, garlic and an egg to bind everything together. I broil my meatballs to brown them, and this step ensures that the meatballs will hold their shape in the soup. While the meatballs are in the oven, I make the base of the soup which includes carrots, onion, celery and plenty of tomato. After the meatballs come out of the oven, they go into the soup to simmer away with the vegetables. The final step is a handful of pasta, which cooks in the broth until tender. I use 90% lean ground beef. It has plenty of flavor but is not overly greasy. You can use any short pasta you like for this soup. I use ditalini, but other great choices are macaroni, rotini or orzo pasta. This soup makes great leftovers, but just be aware that the pasta will continue to soak up the broth as it sits in the fridge. You may need to add more broth when you go to reheat your soup. Meatball soup is hearty enough to stand alone as a complete meal, or you can serve it with a side of garlic knots. I like to make my meatballs on the smaller side (about 1/2 inch to 3/4 inch in size), it’s easier to eat them in the soup that way. There are so many different ways to customize meatball soup – you can use different types of meat, add more vegetables or change up the seasonings. Sausage & Mushroom: Use 50% Italian sausage, 50% ground beef in the meatballs, and add 8 ounces of sliced mushrooms when you stir in the pasta. Turkey & Spinach: Use ground turkey instead of beef, and swap out the beef broth for chicken broth. Add 2 cups of baby spinach leaves to the soup during the last few minutes of the cook time. 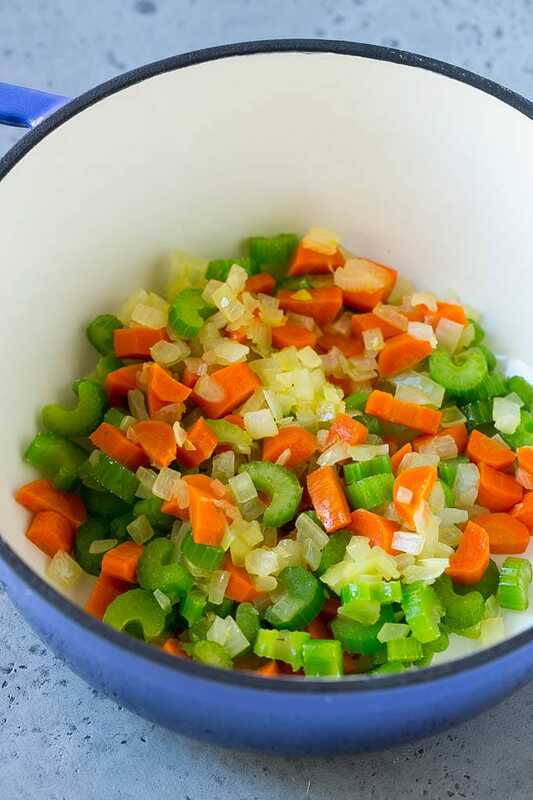 Veggie Lovers: Add 1 cup of frozen mixed vegetables during the last 5 minutes of the cook time. I serve this meatball soup with a sprinkling of parmesan cheese and fresh parsley for the perfect finish. Your family is sure to enjoy this soup as much as my family does! 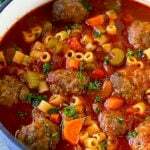 This Italian meatball soup is tender beef meatballs, vegetables and pasta, all simmered in a rich tomato broth. An easy dinner option that's perfect for a busy weeknight! For the meatballs: place all of the meatball ingredients in a large bowl. Stir with a large spoon or use your hands to combine all the ingredients. You can add a few teaspoons of water if needed to make the process easier. 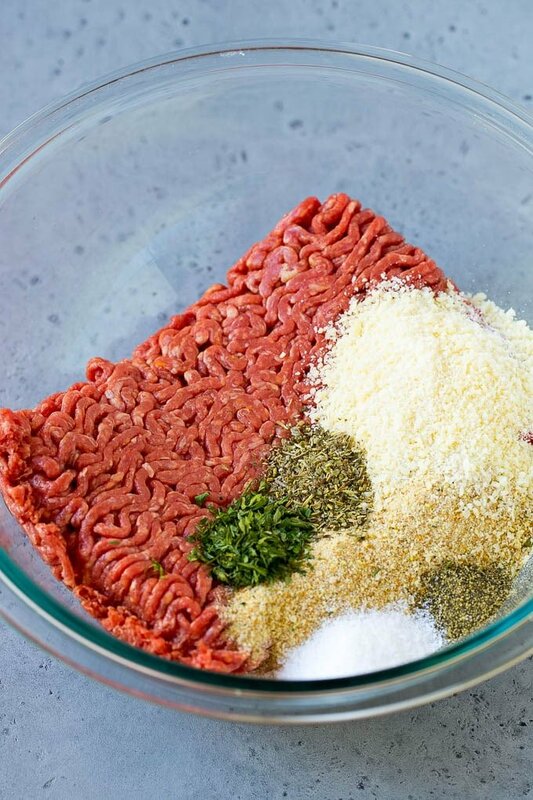 Shape the meat mixture into small balls (1/2 inch to 3/4 inch in size). Place on a sheet pan lined with cooking spray. Coat the tops of the meatballs with cooking spray. Broil for 8-10 minutes until meatballs are lightly browned. While the meatballs are cooking, heat the olive oil in a large pot over medium heat. Add the onion, celery and carrots. Cook the vegetables for 4-5 minutes. Add the crushed tomatoes, tomato sauce, beef broth, Italian seasoning, salt and pepper. Bring to a simmer. Add the meatballs and pasta to the soup. Simmer for 10 minutes, or until pasta and vegetables are tender. Top with parsley. Serve with parmesan cheese if desired. What do I put the oven on to broil the meatballs? I just have a broil button on my oven, which I select and it heats the top element to 500 degrees F.
I added dark red kidney beans to make it extra hearty. It was delicious! Do yourself a favor and make this a day before you plan to serve it. The first day it was good…the second day it was AMAZING! My family loves meatball subs. Like that is an understatement! I bet that they would fall in love with this as well. Can I use pre made frozen meatballs from the grocery store? Absolutely, it’s a great way to save time! Great .. I was wondering about the frozen meatballs too ..
Its a good soup just have to remove the meatballs. I am pescatarian so no meat. This recipe instantly made me hungry! I’m giving this a try this week! 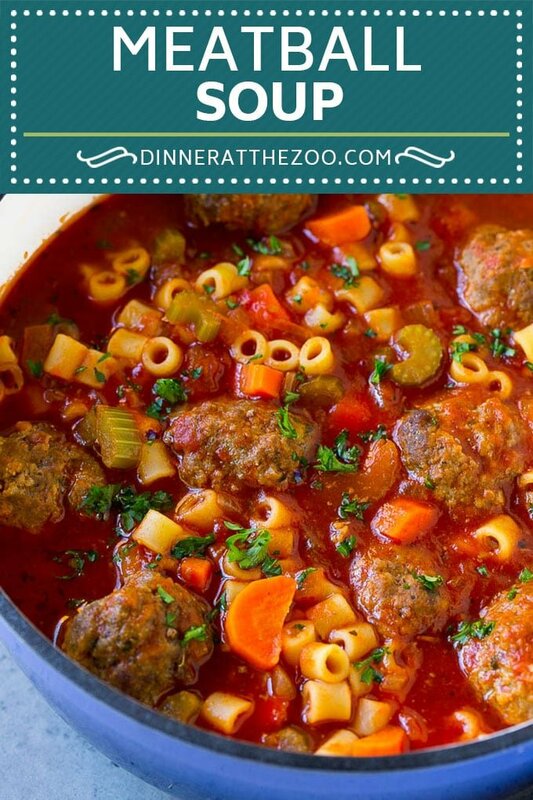 I like how you described this dish – “It has similar flavors to the classic spaghetti and meatballs, but in soup form.” I am adding this to our meal plan for next week. Sounds like a real winner to me. I love Italian Meatball Soup! I always cook it during special occasions. I would like to try your recipe and see if it’s a better one with mine. A delicious soup for this cold weather. I’ve always been terrible at meatballs though so, I may just throw in the hamburger without the balls, ha! Ooo yum!! This looks delicious. I think it could be a huge hit with my family… I’ll have to try it soon. This is an awesome soup! I love and appreciate all and any soup recipes. I look forward to making this one. I’m SUCH a fan of meatballs and enjoy them just with some sauce and a chunk of bread! But your recipe for this soup looks so perfect for a cold day and for leftovers! I love that you made your own homemade meatballs for this soup. 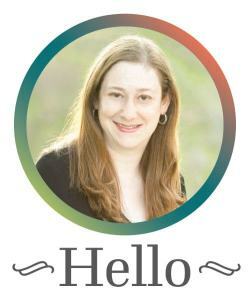 This is one my husband would be thrilled to see on the table, so I’m printing it off now to make next week. Thanks! This looks so perfect for the winter months. I love how hearty and warm this is. It looks like a great recipe! I LOVE making meatball soup! It’s my two favorite things all rolled up into one. I can’t wait to try this recipe.